We all know the importance of water to sustain life. Georgians make a significant investment in landscaping and watering which is a significant part of their maintenance expense. The Atlanta drought and the subsequent increase in water bills have put water conservation on the forefront of strategies for landscape maintenance. The irrigation industry is growing and evolving to meet the needs of the ever changing landscape. The industry has been on the forefront of using technology to conserve water and protect the environment. Manufacturers are researching new and different ways of economically and efficiently getting water to plants. Water conservation by preventing waste like overwatering and runoff s is a main concern. New technology takes plant needs and environmental factors into consideration. When we know the watering requirements for each plant, we can install controllers with sensors and smart programming to better understand the plant’s location, topography and climate. This new technology factors in the amount of water coming out of the soil using evapotranspiration (ET) and moisture sensors to know when and how much water to apply. Factors such as soil type and slope can also be used to determine how much water can be applied before the soil reaches capacity and creates runoff. Smart controllers that account for actual weather conditions have been on the market for years but the new, smarter ones actually look at forecasted weather. Amazingly, these controllers can decrease watering if rain is in the forecast or program additional watering if a dry heat spell is predicted. Controllers can now interface with smart phones and tablets so that homeowners can more easily make program adjustments without having to be on site. Additionally, companies that develop home automation systems are now adding irrigation and outdoor lighting to the items that can be controlled. 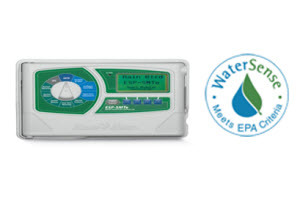 Manufacturers are creating more advanced products that solve over watering. Excessive water pressure is a significant cause of wasted water use. Rain Bird Corporation is at the forefront of creating rotors and sprays that control water at each head. They have developed a Pressure Regulating Stem (PRS) that is put into the rotors and sprays. Rain Bird has also improved their nozzles with devices that use denser streams of water and lower trajectories to fight the wind and improve the accuracy of targeting water to a specific zone. Complete system regulators and valve-pressure regulators are also improving as more and more communities are making pressure regulation a requirement. Not to be outdone, Hunter Industries reports up to 30% more efficiency with some of its nozzle technology. Use of reclaimed water is being considered in many municipalities. Water recycling is one sure way to beat wasted fresh water usage. However, grey water usage (wastewater produced from baths and showers, clothes washers, and lavatories) as opposed to black water (wastewater generated by toilets, kitchen sinks, and dishwashers) is still being researched and is not presently an acceptable or practical method of irrigation in Georgia. Homeowners would have to install a complete treatment system which can be cost prohibitive. Educating consumers on water efficiency is an essential part of water conservation efforts. 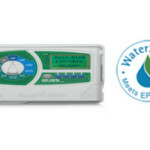 Staying abreast of the newest water-management products and the emerging technology requires understanding the industry and our customer needs. We develop relationships with customer to understand their needs and propose the best products within each homeowner’s budget. Our need for water is unlimited but water is a very limited resource. Dallas North will continue to keep informed of irrigation industry trends and the best water management practices available and to do our best to provide our customers with the best value tailored to our customer’s needs.